Beginning in late 2014 Indianapolis became the site of the largest electric car share operation in the nation. With this development Indianapolis has become the leader in this very important step in changing transportation within dense metropolitan areas. Prior to this the only electric car share operations were on the west coast. Indianapolis and Indiana received positive press coverage in the Spring of 2014 when Forbes Magazine carried a story about Blueindy. This service will provide electric vehicles for hourly rental at convenient locations across the city. 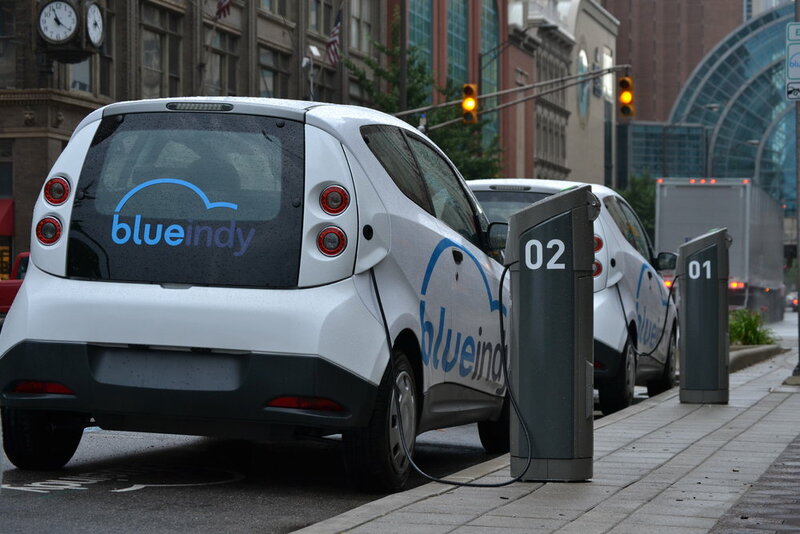 Blueindy plans to establish 200 stations with 500 vehicles in Indianapolis during the first phase of the project. This will ensure that the vehicles are readily available to many Indianapolis residents. The BlueIndy cars can travel around 150 miles per charge. Subscribers to the Blueindy service pick up a car at one of the 200 stations using an automated system to reserve a car and a credit card sized key to unlock the vehicle. The subscriber can then drive the car and drop it off at the same or a different station when it is no longer needed. They pay for the length of time from unplugging the car at the pick-up station to the time of plugging it in at the return station. Blueindy is being developed by a French group in conjunction with Indianapolis. It is the next step in Indianapolis Mayor Greg Ballard’s crusade to help the city go green. A similar service was launched in 2011 in Paris, France and it has been a runaway success. The Paris service has been used by 140,000 subscribers who have taken 5 million trips as of early 2014.